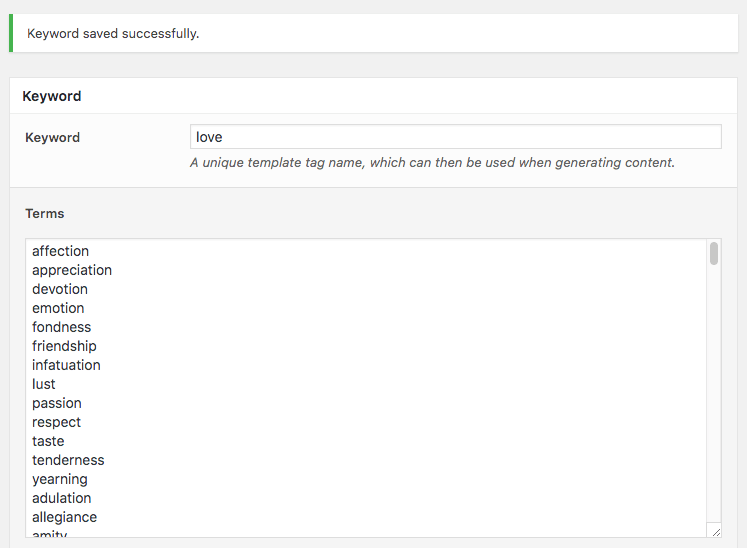 Keywords can be seen as template tags, with each Keyword comprising of one or more Terms. There’s no limit to the number of terms a Keyword can have. Keywords are then used throughout your Content Groups. A Content Group defines a content template, from which Page Generator Pro will generate your Pages, Posts and/or Custom Post Types. 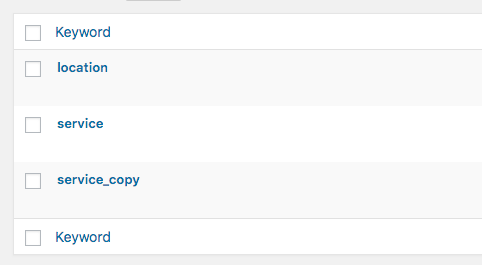 For each generated Page, Post or Custom Post Type, a different Term within each Keyword will be used. Don’t worry if this conceptual structure doesn’t make sense immediately; working through the Documentation will join these concepts up, explaining them in more detail. 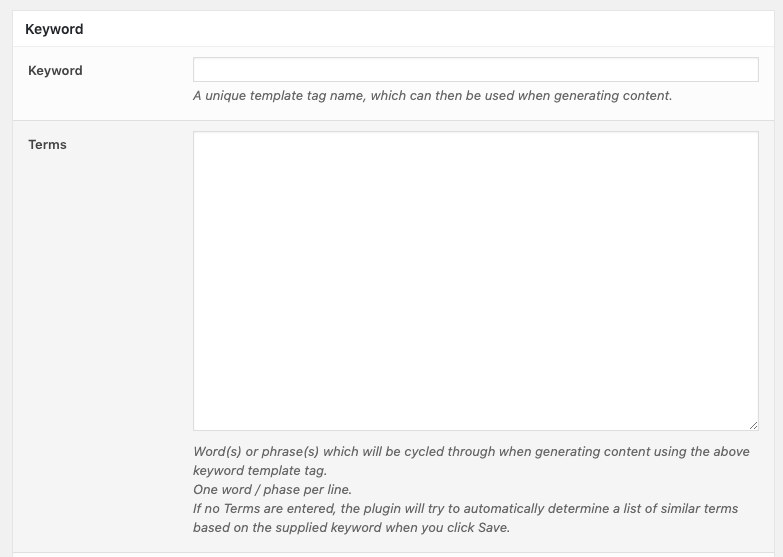 Keyword: the unique template tag you’ll use when generating Pages / Posts / Custom Post Types. The Keyword must be unique from any other Keywords that you might have already defined. Make sure to only use letters, numbers and underscores. Spaces and other characters will not work. 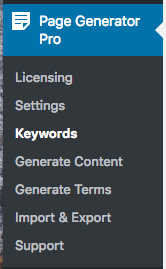 Terms: here, you’ll list the words or phrases that will be cycled through when generating content containing this Keyword. Each word or phrase must be on its own line. When you’re finished, click the Save button. A notification will be displayed confirming that the Keyword saved successfully. If you try to create / change a keyword to one that already exists, you’ll receive a warning telling you that the keyword has already been specified. Each keyword must be unique. 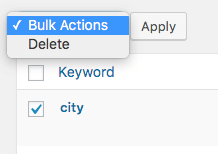 If you already have a list of Terms that you want to use for a Keyword, the Data Import option on the Keywords Form can be used to quickly import your Terms. This saves having to manually type, or copy and paste, your existing Terms into Page Generator Pro. In the Data Import option, upload your text file. This will append the data to the end of the Terms field – so any existing Terms that you might have specified will remain. To add multiple Keywords and Terms from a CSV file, refer to the Import CSV documentation. 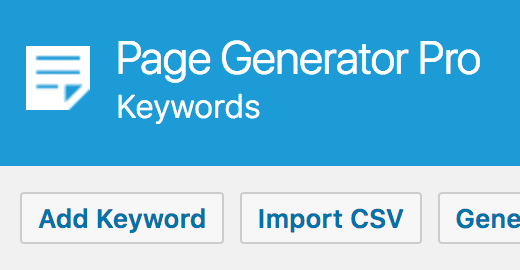 If you are creating a keyword, but cannot think of a list of Terms, similar words or synonyms to use, Page Generator Pro will attempt to automatically populate the list of Terms for you. When adding or editing a Keyword, you’ll see options on the Keywords form to optionally define a Delimiter and Columns. When specified, these provide greater control over which part of a Term to output when using the Keyword in our content. There should be no spaces in the columns field. 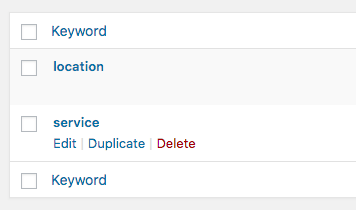 To edit an existing Keyword, click the Keyword name in the Keyword table. 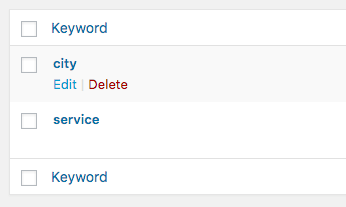 In the Keywords form that is then displayed, change any options as necessary, clicking the Save button when done. If you try to change a keyword to one that already exists, you’ll receive a warning telling you that the keyword has already been specified. Each keyword must be unique. Hover the mouse cursor over the Keyword that you want to duplicate. Once a Keyword is deleted, it cannot be restored. Any Content Groups that use this Keyword will need to also be updated.